Today's post is aimed at all you mamas (or mamas to be!). I'm going to be running some posts reviewing the baby items that have really turned out to be worth it. There are literally so many gadgets, aids and products aimed at parting new parents with their cash, and deciding what is worth the spend and what isn't is so hard. Some items turn out to be amazing and you wonder how on earth you lived without them (nod to the Boba Air carrier, the Poddle Pod and my beloved SkipHop Duo Deluxe changing bag here, all of which I'll be reviewing) and some items are a big waste of money (looking at you, Moses basket and changing table). Then we come to the items where I just kind of sit on the fence… And the Mamascarf is one of those. Designed by a mother for breastfeeding mothers, this is definitely useful for those planning to breastfeed in public. It's a nursing cover that can also pass as a stylish scarf, which is great. Previous ‘apron style’ breastfeeding covers I've tried look like you're waiting for a lobster dinner and honestly just draw more attention to the situation when you're out and about. It's lightweight and easily rolled or folded away in a changing bag, and equally looks good worn as a scarf in its own right. 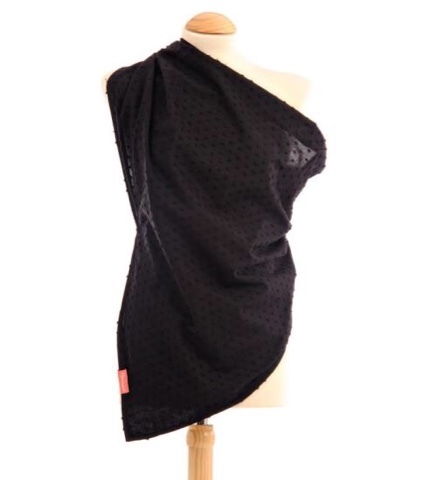 The design I chose is black with textured dots woven in- the type of design I would choose to wear in my every day life. It's made of 100% cotton and easily chucked in the wash, something that is pretty much essential around babies! There's a little built in pocket to hold breast pads if you use them (I don't normally, but it's good to know it's there!). Using it is as simple as tying in a loose knot around your neck, keeping you covered up but allowing you to see what your baby is doing! Now that Theo is a bit older, I've found he also gets quite distracted during a feed if there's a lot going on around him, so this is quite useful for blocking his vision when we're feeding out. 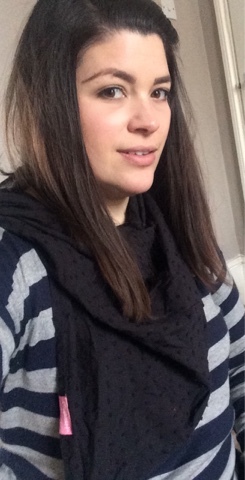 My top tip for breastfeeding discreetly in public is actually layering. I always wear a thing, stretchy vest top - the kind you can pick up for £1.50 at Primark- under my usual top. I pull it down at the neck, while my other top goes up. That way, my tummy is still covered up and there's not much chance of flashing anything. But using a scarf like this as well just gives you much more freedom of movement. While you're fussing around and trying to get baby latched as you get used to it all, its also good for keeping things covered then. Also, if you tie it correctly (I recommend looking up their videos on YouTube) it can help take some of baby’s weight to relieve your arms. But here’s the thing… Although I really like the Mamascarf, I do think any large scarf with enough fabric does the same job. At £17.99, there are lots of options available that would do the job just as well. However, if you like the design of it as a scarf, like I do, it's still a good buy. 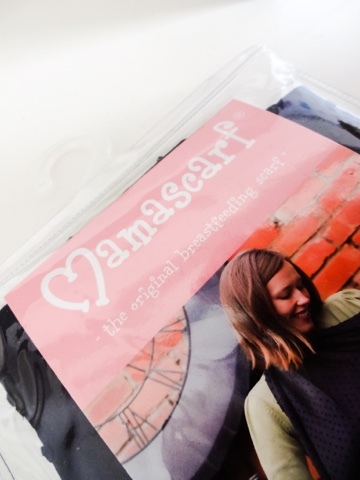 But don't be fooled into thinking ‘breastfeeding scarves’ are any different from normal large scarves, because as long as there is enough fabric, you'll be able to cover up well enough. If you do like the look of it, the Mamascarf is available in French Navy, Cream, and the Retro Leaf print. For me, I was missing a black scarf in my collection, so it filled that hole and the texturing is a nice touch that just lifts the design a little. This would also make a really nice baby shower gift as it's the kind of thing where you don't realise how useful it is until you've got one! You can pick up a Mamascarf on Amazon.